Sometimes there might be the scenario where we need to create and map the custom field of process form to third party form. In our case its OID. Lets see the steps to create the same. For creation of custom field on process form follow the link "http://www.iamidm.com/2015/09/custom-udf-creation-on-process-form-in.html". In this lab we are going to map "ProFormTest" custom filed of procee form to "title" field of OID. 1) Start your weblogic, oim and wls server. 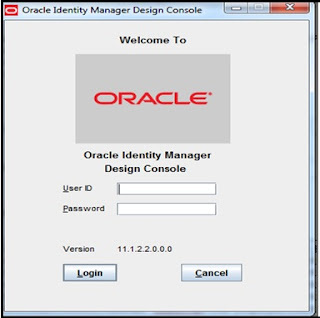 2) Open the OIM design console and provide the username and password as shown in figure below. 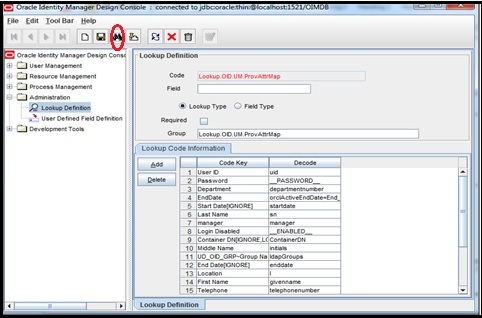 3) On the design console Window, Go to “Administration-->Lookup Definition”. Double Click on Lookup Definition. A new blank window opens on left side as shown in figure below. 4) In the code value insert “Lookup.OID.UM.ProvAttrMap” and click on search as show in figure below. 5) Click on Add. In the Code Key write “ProFormTest” and in decode key write “title” as show in figure below. 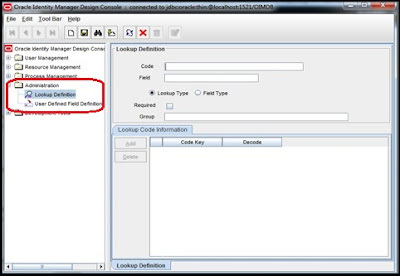 Make sure that the code key contains the same name as that on the process form. Here in the decode key we have use title because we are mapping to title filed in OID Form. And click on Save as shown in figure below. 6) Login to OIM Identity console. Create any user from OIM . Go to account of that user and click on Request Account. 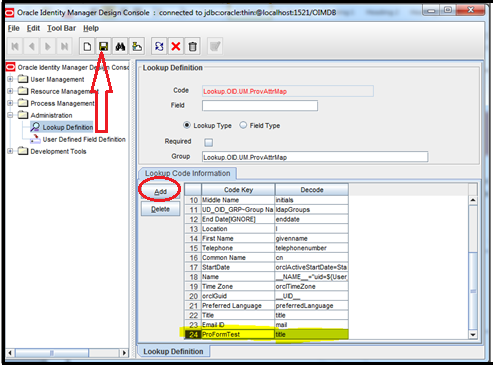 Search the catalog and Make sure you select the “Application Instance” Related to OID. After selecting Application instance, click on Add to cart and then click on check out. After this fill the form. You can insert the contents as per your choice. Once done click on Ready to submit and then click on submit as shown in figure below. 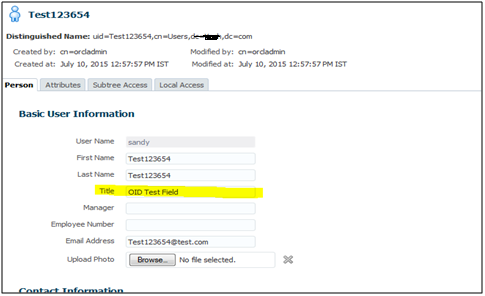 7) Login to OID to see whether the content we have inserted in “ProFormTest” navigate to OID or not. In this way we have mapped the attributes from process form to OID.